Animal Friends this year is also organizing Animal Friends Days by which it wants to mark all the important dates regarding animal rights and vegetarianism and also the fifth year of the organization. 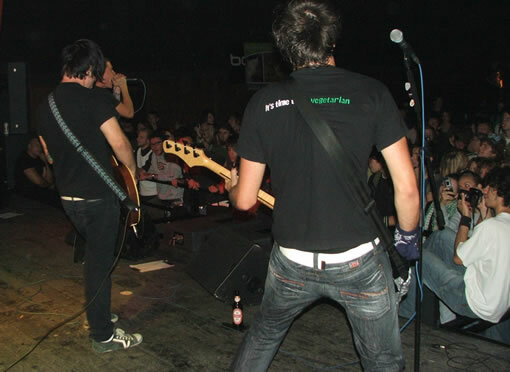 Friday, September 29, 2006 – the second time in a row a free concert with vegan tasting will be held in the Boogaloo Club (ex OTV, Vukovarska 68) starting at 8 P.M. The following bands will play: Nervousstand, Scroll, Dead by Mistake, Igut, and Hidden Layer. Saturday, September 30, 2006 – On the corner of Varsavska ulica and Petar Preradovic Square, an information stall will be placed where the petition for a better vegetarian offer can be signed; by this petition all stores and chain stores are provoked to expand their vegetarian offer due to increased number of people that recognize the advantages of this type of diet. Sunday, October 1, 2006 – on the World Vegetarian Day, in Maksimir Park, within the program that is organized by City's Committee for Agriculture and Forestry, members of organization at 12 noon will invite everybody to vegetarian food tasting. Also, for the youngest drawing and coloring of the animals will be organized. They will be awarded with healthy and tasty cookies made without eggs or cow milk. 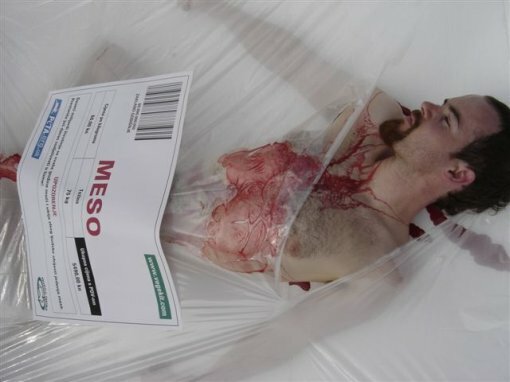 Monday, October 2, 2006 – on the World Farm Animals Day, on Ban Jelacic Square at 12 noon, a provocative performance will be held, where "naked and bloody activists" will try to encourage people to think about billions of animals captivated on farms so they can be killed for human habit of meat-eating. Tuesday, October 3, 2006 – on the World Lab Animals Day, on the corner of Varsavska ulica and Petar Preradovic Square at 12 noon, Animal Friends will be showing a video footage of animals tortured in laboratories and handing out so called "black and white list" of companies that do (not) test their products on animals. 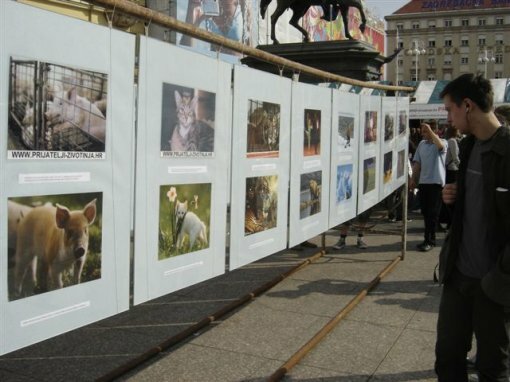 Wednesday, October 4, 2006 – on the World Animal Protection Day, also in the City's Committee for Agriculture and Forestry program, on Ban Jelacic Square, Animal Friends will install a photo-exhibition on a six meter high iron construction. Photographs will be showing animals in their natural surroundings and artificial ones where they are molested and exposed to violent death by mankind. During this six days program, Animal Friends members will be handing out postcards, along with all the other educational materials. We invite all those who are interested that they mark these four international days with us!